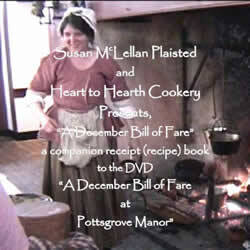 "A December Bill of Fare at Pottsgrove Manor"
This first in the "Hearthside" series of DVDs from Susan McLellan Plaisted and Heart to Hearth Cookery demonstrates the preparation and service of a three-course 18th century December dinner at Pottsgrove Manor. 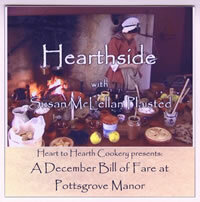 Narrated by Susan herself, you'll see the techniques used in the making of the dishes in the hearth at the Manor. Featured hearth cooking techniques are Clock-Jack Spit and Grisset, Three-Tiered Bake Kettles, elevated Griddle and Posnet. The DVD includes a booklet (pictured below) of original receipts (recipes) used in preparing the dishes for the December Bill of Fare. Music is provided by Pan's Fancy. Orders are now being shipped. Contact Susan to order, or use PayPal below for faster ordering.  Images and text copyright 2003-2014 Susan McLellan Plaisted.